در این پژوهش، اثر ریزساختار ریختگی بر فرایند بازیابی و تبلور مجدد فولاد زنگ‌نزن دوفازی 2304 مورد بررسی قرار گرفته است. نمونه‌هایی با ریزساختار اولیه ریختگی در دماهای پایین کارگرم 850 و 950 درجه سانتیگراد و دمای بالایی کارگرم 1050 و 1150 درجه سانتیگراد و در سرعت کرنش‌های مختلف 001/0، 01/0، 1/0 و 1 (بر ثانیه) با استفاده از آزمون فشار گرم مورد تغییر شکل قرار گرفتند. تغییرات ریزساختاری با استفاده از میکروسکوپ نوری مجهز به سیستم آنالیز تصویر مورد مطالعه قرار گرفت. همچنین میزان انرژی فعال‌سازی ظاهری کارگرم بر اساس داده‌های تنش-کرنش آزمون فشار گرم تعیین شده است. نتایج حاصل از این پژوهش نشان داد که ساز‌ و‌ کار ترمیم در شکل‌دهی گرم فولاد زنگ‌نزن دو فازی 2304، در دو فاز متفاوت است به گونه‌ای که در فاز فریت به وسیله فرایند بازیابی و در فاز آستنیت، توسط فرایند تبلور مجدد رخ می‌دهد. همچنین میزان انرژی فعال‌سازی ظاهری کارگرم برای این فولاد با ریزساختار اولیه ریختگی، در دما‌های 850 و ‌1150 کارگرم به ترتیب 325 و 150 کیلو ژول بر مول است که نسبت به حالت کارشده، مقادیر پایین‌تری را نشان می‌دهد. 2Assistant Professor, Materials and Polymer Engineering Department, Hakim Sabzevari University, Sabzevar, Iran. In this research, the effect of cast microstructure on the recovery and recrystallization process of 2304 duplex stainless steel has been investigated. The specimens were hot-formed at low temperatures of 850°C and 950 °C and high temperatures of 1050 and 1150°C by using hot compression test machine at strain rates of 0.001 to 1 s−1. The microstructure changes were studied using optical microscopy equipped by image analyzer. In addition, the apparent activation energies were determined based on the stress-strain hot compression curves. The results show that during of hot deformation of 2304 two-phase stainless steel, the restoration mechanisms in two phase are different, it is performed by dynamic recovery in the ferrite phase and by recrystallization process in the austenite phase. The apparent activation energy Q of the cast microstructure at 850 and 1150 temperatures of hot working is 325 and 150 kJ/mol respectively, which is lower than the applied wrought microstructure. Cizek P., Wynne B.P.., A mechanism of ferrite softening in a duplex stainless steel deformed in hot torsion, Materials Science and Engineering A, 1997, 230 (1-2) 88-94. Mao P., Yang K., Su G., Hot deformation behavior of an as-cast duplex stainless steel, Materials Science and Technology, 2003, 19, 379-381. Practical Guidelines for the Fabrication of Duplex Stainless Steels, Published by the International Molybdenum Association (IMOA), London, UK. 1999. Maehara Y., Effect of microstructure on hot deformation in duplex stainless steels, Scripta Metallurgica et Materialia, 1992, 26(11) 1701-1706. Johansson P., Liljas M., A new lean duplex stainless steel for construction purposes, Proceedings of 4th European Stainless steel Conference Science and Market, Paris 2002. Maehara Y., Fujino N., Kunitake T.: Trans. ISIJ, 1983, 23, 247. Wei Z., Laizhu J., Jincheng H., Hongmei S., Study of mechanical and corrosion properties of a duplex stainless steel, Materials Science and Engineering A, 2008, 497, 501–504. Martins M., L.C. Casteletti, Microstructural characteristics and corrosion behavior of a super duplex stainless steel casting, Materials Characterization, 2009, 60(2) 150-155. Martins M., Casteletti L.C., Sigma phase morphologies in cast and aged super duplex stainless steel under hot working conditions, Materials Characterization, 2004, 24, 1-10. Cizek P., Wynne B.P., A mechanism of ferrite softening in a duplex stainless steel deformed in hot torsion. Materials Science and Engineering A, 1997, 230 (1-2) 88-94. Duprez L., De Cooman B.C., Akdut N., Flow stress and ductility of duplex stainless steel during high-temperature torsion deformation, Metallurgical and Materials Transactions A, 2002, 33(7) 1931-1938. 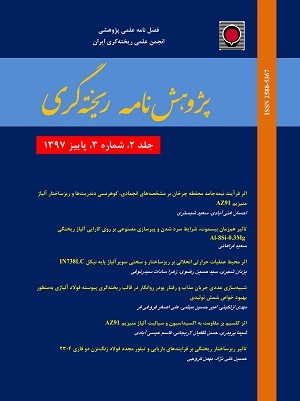 Farniush H., Momeni A., Dehghani K., Aghazadeh J. Mohandesi, Keshmiri H., Hot deformation characteristics of 2205 duplex stainless steel based on the behavior of constituent phases, Materials and Desing, 2012, 311, 220-226. Humphreys F.J., Hatherly M., Recrystallization and Related Annealing Phenomena, Pergamon Press, 2004. Luo J., Effect of the strain on the deformation behavior of isothermally compressed Ti-6Al-4V alloy, Materials Science and Engineering A, 2009, 505(1-2) 88-95. Bruschi S., Workability of Ti-6Al-4V alloy at high temperatures and strain rates, Materials Letters, 2004. 58(27-28) 3622-3629.